Photo: Claud D. Grove and Berenice Sinclair Grove House, ca. 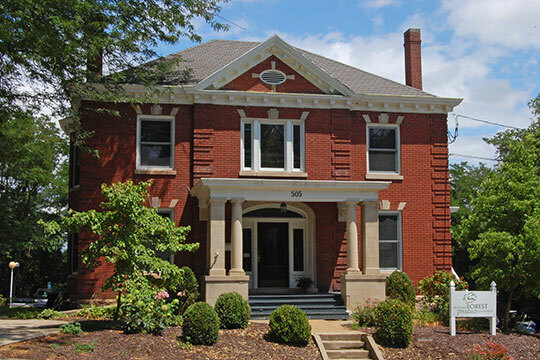 1912, 505 East State Street, Jefferson City, MO. Listed on the National Register of Historic Places in 2002 and 2012. Photographed by user:Annecox (own work), 2014, [cc-by-3.0 (creativecommons.org/licenses/by/3.0)], via Wikimedia Commons, accessed February, 2016. The Cole County Courthouse is located at 301 East High Street, Jefferson City MO 65101; phone: 573-634-9100. This county is situated near the center of the State, is bounded on the northeast by the Missouri River, on the west by Moniteau, on the south by Miller County, and on the southeast by the Osage River, which enters the Missouri at the eastern extremity of the county. Population in 1860, 9714. Physical Features. — The face of the county is generally rolling or broken, with thin soil, generally well adapted to the growth of small grain and fruit of all kinds. On the bottoms of the Missouri, Osage, and Moreau, is good alluvial soil, very fertile, embracing, perhaps, one-fourth the area of the county. The soil and climate are favorable to fruit culture; the peaches seldom fail, and all kinds of fruits, including the grape, yield abundantly. The interior of the county is drained by Moreau Creek, which rises so rapidly and to such a height, that it is upon some maps called a river. Fish are numerous in this stream; and it is related by a former representative from this county who had a mill upon the Moreau, that the fish were so numerous as to frequently clog the wheels and stop the mill. Then the only alternative was to shut the gate, and beat the water with poles, and drive them away! Building Materials — The beautiful limestone, called "Cottonrock," of which the Capitol is constructed, is very abundant in this county, and forms a stratum of upwards of forty feet in thickness, in the bluffs upon which Jefferson City is situated. Sandstone suitable for building; clays and sands for brick are also abundant and convenient. Limestone suitable for making hydraulic cement is found in the bluffs above the city. Lumber of every kind is found on the bluffs and valleys in Cole County, or in the Missouri bottoms above and below the city. Cole County was formed from Cooper, November 16, 1820, and named in honor of Captain Stephen Cole, the intrepid and courageous pioneer. There were settlements within the present limits of the county as early as 1816, but white families were "few and far between" until after 1820. In 1821 the population of the county was about 1300. The county-seat was located at Marion, (fourteen miles above Jefferson) in 1822, and removed to Jefferson City, in 1828. The first settlers were from Kentucky and Tennessee. The seat of government of the State was removed from St. Louis to St. Charles in 1821, and from thence to Jefferson City in 1826, where it is permanently located. At the time of the admission of this State into the Union, Congress granted four sections of land for the location of the seat of government. The constitution fixed the location of the capital upon the Missouri River, to be within forty miles above or below the mouth of the Osage. At the first session of the Legislature, commissioners were appointed, who, after a tedious examination, selected four sections, where Jefferson City has since been built up. Major Elias Barcroft was appointed Surveyor, who laid the ground selected off into lots, under the superintendence of the commissioners in 1822. The first sale of lots took place in May, 1823, under the supervision of Major Josiah Ramsey, Jr., Captain J. C. Gordon, and Adam Hope, Esq., Trustees on the part of the State. At the same time the building of a brick State-house was let to the lowest bidder, Daniel Colgan, and afterward transferred to James Dunnica, of Kentucky, who built the Capitol at the bid, $25,000. At this time (1823) there were but two families residing in the place, to wit, Major Josiah Ramsey, Jr., and Wm. Jones, both of whom kept houses of entertainment. The State-house was completed at the stipulated time, and the Legislature assembled in the pew State Capitol (just completed) on the third Monday in November, 1826. Up to this date, all the families that resided at the seat of government were as follows: Wm. Jones, brick-mason, and keeper of entertainment; Josiah Ramsey, Jr., postmaster, and tavern keeper; John C. Gordon, carpenter, and keeper of entertainment; Daniel Colgan, merchant; Jesse F. Roystan, teacher, and justice of the peace; James Dunnica, carpenter, and builder of the State-house; Harden Casey, blacksmith; Robert A. Ewing, sawyer; Alexander Gordon, stonemason; John Dunnica, carpenter; John P. Thomas, carpenter; Reuben Garnett, brick-mason; Stephen O. Dorriss, physician; James R. Pullen, stonemason; Christopher Casey, constable; Henry Buckner, farmer; Hiram H. Baber, Esq., teacher, and justice of the peace; David Scrivner, laborer; Samuel Harrison, laborer; Geo. Woodward, merchant; and Terry Scurlock, carpenter. Besides these, were the following named single men: David Slater, carpenter; Granville P. Thomas, carpenter; Robert H. Jones, first merchant in the place; Azariah Kennedy, carpenter; Willis Thornton, carpenter; David Harmon, carpenter; Wm. Henderson, carpenter; Mr. Thompson, carpenter; McDaniel Dorriss, distiller; and Mr. Moss, grocery keeper. The present State Capitol was commenced in 1838, and first occupied by the Legislature of 1840-41, and cost about $350,000. The stone for the building was taken from the bluffs near by, along the line of the Pacific Railroad in front of the city. The limestone for the pillars was from Callaway County. Mr. S. Hills, the architect, here planned one of the best buildings in the West, either as regards its substantial character, architectural beauty, or the interior arrangement of the legislative halls, and the several State offices. The principal public buildings in the city are the Capitol, the State Penitentiary, the Courthouse, (all substantial stone structures,) the Female College, and the Male High School. There are a number of commodious and pleasantly situated private residences in the city. The governor's mansion has a commanding location, but is inferior to the other State buildings, and will probably soon give way to a new one, which will be more creditable to the State, Churches and Schools. There are six churches in the city, namely: Episcopal, O. S. Presbyterian, 2 Methodist, Baptist, Catholic, Lutheran. Of schools, there is an excellent Female College, and a Male High School, well conducted; and about 35 district schools in various parts of the county. Business Men needed — Iron founders, manufacturers of farming implements, wagon and carriage makers, soap and candle manufacturers, millers, beef and pork packers, machinists, stock growers and grape culturists will all find good openings here. Stone coal is abundant and cheap, timber plenty, excellent building stone every where, and soil that for small grain, grasses, and fruit is seldom surpassed. With the Missouri River and Pacific Railroad, this county has an excellent outlet to market, and offers many advantages to the industrious and the energetic. There is no town of any importance in the county, except Jefferson City, the county-seat, which has a population of 3,000. Marion, the former seat of justice, has now less than 50 inhabitants; Russellville, in the western part of the county, 16 miles from Jefferson, is a place of perhaps 100 inhabitants. Of business houses in the county, there are of lawyers, 12; physicians, 12; merchants, 15; druggists, 3; silversmiths, 3; tinners, 3; blacksmiths, 6; wagon-makers, 4; saddlers, 3; tailors, 5; shoemakers, 10; cabinetmakers, 3; carpenters, 20; paint-shops, 3; marble manufactories, 2; tanneries, 2; steam saw, planing, and lath mill, 1; steam flouring-mill, 1; and hotels, 5. The "Jefferson Examiner" and " Inquirer" are the only papers published in the county. The former is published daily during the session of the Legislature, and weekly the remainder of the year. The "Jefferson Inquirer," after having been published 21 years, was temporarily discontinued in the fall of 1859.